As I continue to process the images from my Eastern Sierra trip, I wanted to leave you with some other work I have been developing for the past several months. For the past few months, you may have noticed that I have shot and posted many images of the Air Force Memorial, in Arlington, VA. It just so happens that I have been working in an official capacity for the Memorial. My work will be featured in many publications for the Air Force Memorial, including the 2014 Calendar, murals, and magazines. So far, this relationship has allowed me to take some images of the Air Force Memorial that have not yet been captured. I have captured a dramatic, full-on view of the Memorial right after a strong storm, amongst other views and more that I will share with you over the coming weeks. 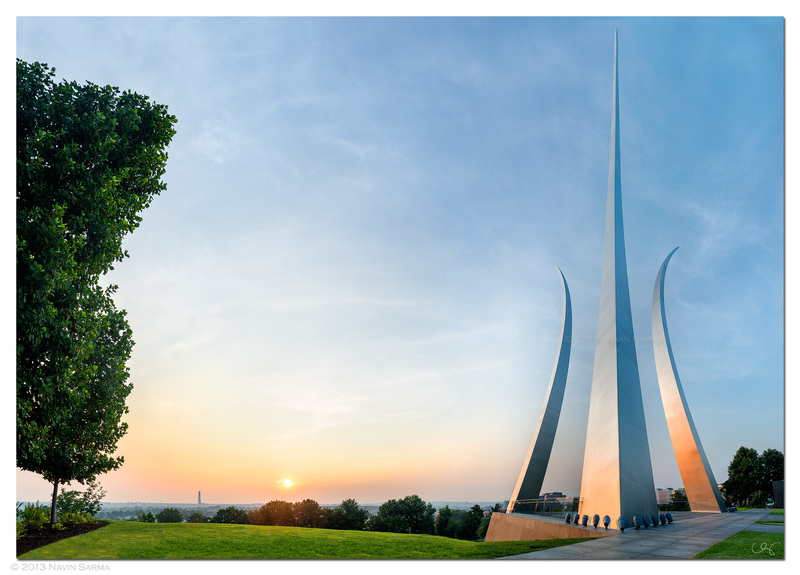 More recently, after some inspiration from renown wilderness photographer Marc Adamus, I have been trying some perspective blending techniques to capture even more unique views of the Air Force Memorial. The structure itself rises so high off of the ground, that often times, it is difficult to capture the Air Force Memorial in a single shot. Therefore, I have been using multiple exposures to cover a larger field of view than traditionally allowed, and blending/transformation techniques within Photoshop to merge the images together to form a cohesive view. Using this technique, I was able to capture a composition that has not yet been seen: an eastern exposure to the rising sun and Washington Monument, with the entire Air Force Memorial in the foreground. I hope you enjoy this shot and the others to come. Once I get copies of the other Air Force Memorial publications, I’ll be sure to post them here.